4"x 3" Flexible Rubber Fernco, for Cast Iron, Plastic, Copper, Steel or Lead to Cast Iron, Plastic, Copper, Steel or Lead. ID of one end is 4.25" (stretches to 4.5") and the other side is 3.25" (stretches to 3.5") to go over the pipe. Length is about 4". Stainless band clamp on each end. 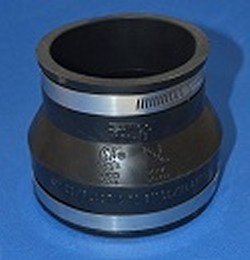 For details see Fernco webpage for 1056-43 Made in the U.S.A.